Tap the Game Center app icon on the Home screen and sign in, if necessary. Tap Me; and then tap the Games bubble. Tap one of your scores. In the dialog that appears, tap the Challenge bubble. Tap a friend in the dialog that appears and then tap Next. In the form that appears, enter a message, if you like, and then tap Send. 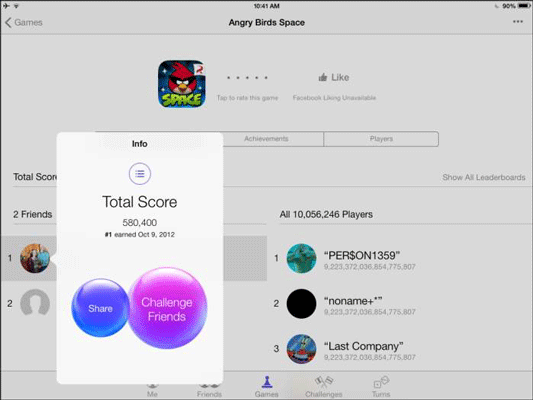 Game Center tracks your achievements, including points and perks that you’ve earned along the way. You can also compare your gaming achievements to those of top-ranking players across the Internet — and check your friends’ scores by displaying the Friends page with the Points portion showing. If your friends aren’t available, you can play a game by tapping its title on the Games page and then tapping Play. You can then compare your scores with others around the world who have also played the game recently.